Supposedly purchased in Germany, c. 1750, by Pehr von Lagerbring [d. 1799], Sweden; sold to David Henric Hildebrand [d. 1791], Castle Ericsberg, Katrineholm, by 1770 or 1771; by descent to his son, David Gotthard Henric Hildebrand [d. 1808]; his grandson, Carl Carlsson Bonde, Castle Ericsberg, as part of the "Fideikommiss;" by descent to Carl Gotthard Carlsson Bonde, Castle Ericsberg. (Galerie Matthiesen, Berlin, 1927). (P. & D. Colnaghi and Co., London and New York, 1927); (M. Knoedler & Co., New York, 1928, owned jointly with Galerie Matthiesen and P. & D. Colnaghi and Co.); purchased 1928 by Andrew W. Mellon, Pittsburgh and Washington, D.C.; deeded 30 March 1932 to The A.W. Mellon Educational and Charitable Trust, Pittsburgh; gift 19937 to NGA. This and the preceding information is corroborated by Carl Jedvard Carlsson Bonde, son of Carl Gotthard Carlsson Bonde, letter of 15 June 1976 and postcard of 16 September 1976 to John Hand, in NGA curatorial files. This information, in slightly altered form, is contained in an M. Knoedler & Co. brochure of 1928, in NGA curatorial files. John Hand also acknowledges Göran Galkenberg, stockholm, conversation of 30 October 1989, and Carl Göran Carlsson Bonde, Castle Ericsberg, for information on the Bonde family. Report of 8 March 1988 from the Getty Provenance Index, in NGA curatorial files. The support is a single piece of linden with vertically oriented grain. The original panel, which was probably thinned, has been marouflaged to a secondary panel and cradled. Examination with infrared reflectography did not disclose underdrawing. The original ground and paint layers do not extend to the extreme edges, although a thin nonoriginal layer and brown overpaint have been applied to the edges. Examinations in 1973 and 1988 yielded very little hard information about the monogram and date. Both appear to lie directly on the paint surface without an intervening layer, and both have been on the painting long enough to develop the crackle pattern of the black paint underneath. X-ray fluorescence indicated the similarity of the paints, but this cannot be taken as an indication of whether or not the date and monogram were executed at the same time. The painting is generally in good condition. There are several long vertical checks in the panel. Along the checks and in the face of the sitter there are scattered paint losses that have been filled and inpainted. The wood was identified by Peter Klein, examination report, 29 September 1987, in NGA curatorial files. Examination of the brown paint under x-ray fluorescence indicated the presence of cadmium and zinc, suggesting that the paint was manufactured in the nineteenth or twentieth century. Buchner, Ernst. "Schäufelein, Hans Leonhard." In Thieme-Becker. 37 vols. Leipzig, 1907-1950. 29(1935):558-559. Strömbom, Sixten Georg Mauritz. Portraitsamlingen: Ericsbergs Fideikommiss. Stockholm, 1917: 21, no. 32. Buchner, Ernst. "Der junge Schäufelein als Maler und Zeichner." In Festschrift für Max J. Friedländer zum 60. Geburtstage. Leipzig, 1927: 72. Buchner, Ernst. "Hans von Kulmbach als Bildnismaler." Pantheon 1 (1928): 135. Winkler, Friedrich. Dürer: Des Meisters Gemälde, Kupferstiche und Holzschnitte. (Klassiker der Kunst 4) Berlin and Leipzig, 1928: 414, repro. 45. Wallach, Hellmuth. Die Stilentwickelung Hans Leonhard Schäufeleins. Munich, 1929(? ): 41. Friedländer, Max J. 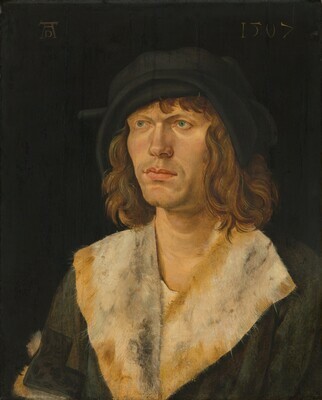 "Albrecht Dürer, 1471-1528 Portrait of a Man." In Unknown Masterpieces in Public and Private Collections, Vol. 1, ed. Wilhelm R. Valentiner. London, 1930: 1:"U.M 63," pl. 63 (as by Dürer). Tietze, Hans. "Dürer in Amerika." Anzeiger des Germanischen Nationalmuseums 45-46 (1932-1933): 101-104, figs. 66-67. Tietze, Hans. "Dürer in America." The Art Bulletin 15, no. 3 (September 1933): 268, , fig. 24. Kuhn, Charles L. A Catalogue of German Paintings of the Middle Ages and Renaissance in American Collections. Cambridge, Mass., 1936: 54, no. 201, pl. 36. "Mellon Offers Nation $19,000,000 Collection of Old Masters." The Art Digest 11 (15 January 1937): 8, repro. 7. Tietze, Hans, and Erika Tietze-Conrat. Kritisches Verzeichnis der Werke Albrecht Dürers. 3 vols. Basel and Lepzig, 1938: 2:81, no. A202, repro. 219. Preliminary Catalogue of Paintings and Sculpture. National Gallery of Art, Washington, 1941: 61, no. 66, as by Albrecht Dürer (?). Book of Illustrations. National Gallery of Art, Washington, 1942: 240, repro. 37, as by Albrecht Dürer (?). Winkler, Friedrich. Die Zeichnungen Hans Süss von Kulmbachs und Hans Leonhard Schäufeleins. Berlin, 1942: 114, 118. Panofsky, Erwin. Albrecht Dürer . 2 vols. Princeton, (1943): 2:19, no. 98. Paintings and Sculpture from the Mellon Collection. National Gallery of Art, Washington, 1949 (reprinted 1953 and 1958): 62, repro., as by Dürer. Roggeveen, L.J. "De National Gallery of Art te Washington." Phoenix 4 (1949): 340. Winkler, Friedrich. Albrect Dürer. Leben und Werk. Berlin, 1957: 191, n. 2. Summary Catalogue of European Paintings and Sculpture. National Gallery of Art, Washington, 1965: 46, as by Albrecht Dürer (?). Löcher, Kurt. "Nürnberger Bildnisse nach 1520." Kunstgeschichtliche Studien für Kurt Bauch zum 70. Geburtstag von seinen Schülern. Munich, 1967: 115. European Paintings and Sculpture: Illustrations (Companion to the Summary Catalogue, 1965). Washington, 1968: 39, no. 66, repro., as by Albrecht Dürer (?). Zampa, Giorgio and Angela Ottino della Chiesa. L'opera completa di Dürer. Milan, 1968: 106, no. 126, repro. Oehler, Lisa. "Das Dürermonogramm auf Werken der Dürerschule." Städel-Jahrbuch N.F. 4 (1973): 43, 47, fig. 12 (given to Hans von Kulmbach). European Paintings: An Illustrated Summary Catalogue. National Gallery of Art, Washington, 1975: 322, repro. 323. Walker, John. National Gallery of Art, Washington. New York, 1975: 155, no. 173, repro. Walker, John. National Gallery of Art, Washington. Rev. ed. New York, 1984: 155, no. 167, color repro. Löcher, Kurt. "Zu den frühen Nürnberger Bildnissen Hans Schäufeleins." In Hans Schäufelein. Vortäge, gehalten anlässlich des Nördlinger Symposiums im Rahmen der 7. Rieser Kulturtage in der Zeit vom 14. Mai bix 15. Mail 1988. Nordlingen, 1990: 106-110, fig. 68. Hand, John Oliver, with the assistance of Sally E. Mansfield. German Paintings of the Fifteenth through Seventeenth Centuries. The Collections of the National Gallery of Art Systematic Catalogue. Washington, 1993: 160-165, color repro. 163. Löcher, Kurt. Review of German Paintings of the Fifteenth through Seventeenth Centuries, by John Oliver Hand with the assistance of Sally E. Mansfield. Kunstchronik 43 no. 1 (January 1995): 18. Metzger, Christof. Hans Schäufelin als Maler. Berlin, 2002: 537-539, no. X-13, repro. Fiedler, Susanne, and Torsten Knuth. "Vexierbilder einer Biographie: Dr. Heinz Mansfeld (1899-1959)." Mecklenburgische Jahrbücher 126 (2011): 300.